" A FOGGY EVENING IN THE NORTHERN FOREST!" A late day rain resulted in an awesome view of fog hanging over the lake and in the surrounding mountains. 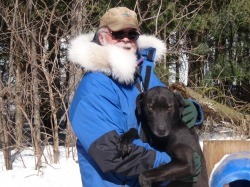 It was another quiet week here with the Spring clean up in the kennel and visiting with a few of my Mushing friends. The Swallows have returned to nest in their house on the garage and have another generation of young. The frogs are filling the night with their mating serenades. The Loons have returned and fill the night air with their mournful cries. The Squirrels and Chipmunks are teasing the dogs with their playful antics. They are especially of interest to the pups. It is hard to believe the pups will be a year old this month. The time sure seems to fly by. Yes, the forest is springing foreword with new life. It is also with great pleasure to announce that Kara Hansen will be joining the Miortuk Team this fall.